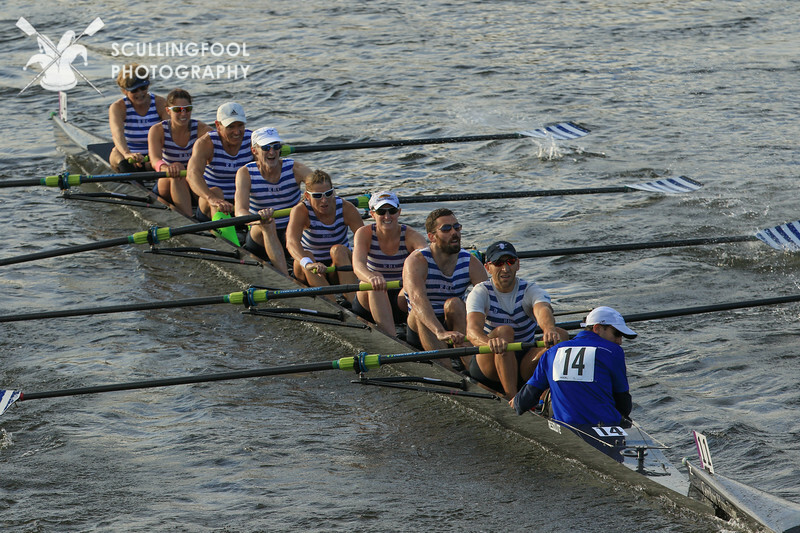 The men’s intermediate lightweight 8+ came less than 0.2 seconds behind Vesper in a nail-biting finish for second place. First place finishes included the men’s E-I 4+ with Elizabeth Bayne, Rudy Schreiber, Nikolay Kurmakov, Ed Frankenberry and Ernest Cook; the men’s D-I 2- with Ernest Cook and John Yasaitis; and the mixed masters 8+ AA-C. The women’s U-23 4+ with Hannah Knight, Kate Maistrenko, Tal Gilad and Maya Hartleben (coached by Nikolay Kurmakov) won their event with a time of 7:20.84. Tom Guncik is one of the latest additions to Riverside. The new men’s sweeps coach brings with him years of experience coaching collegiate rowers, and an exciting vision for the future of the men’s team. In her final job for the Communications Committee, Amanda Milad Cox checked in with Tom about rowing, coaching and how he came to Riverside. How did you first get into rowing? I learned to row as a freshman at Ohio State University. I had never heard of or seen rowing, but I followed my roommate to the crew meeting — thinking it was a fancy name for a debate team or stage crew — because they offered pizza and it might have been a way to make the largest university in the country feel smaller. 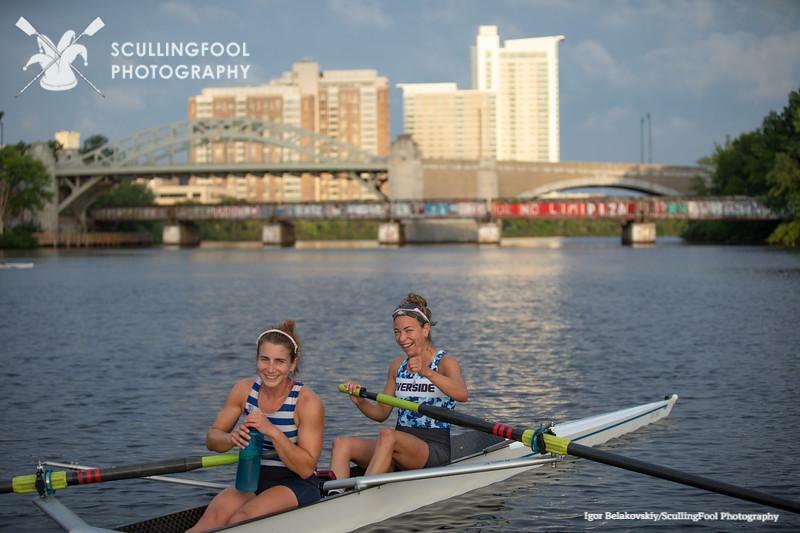 Rowing that first year gave me a year’s worth of new athletic experiences along with supportive teammates, both of which helped me grow up and handle the stress of figuring out who I was. I started coaching the freshmen while I was finishing my senior year at Ohio State, and got my first legitimate coaching job in 2008, a year after I graduated. At the time I was driving 30 minutes every day to a desk job in the suburbs of Columbus Ohio, and gas was $4.19 a gallon. Then my former coach at Ohio State told me was he he was just named the head coach at Bates College, that the season started in a week and he was wondering if I was available. The chance to have a 10 month paid vacation in Maine seemed like a good alternative to what I was doing in Columbus. 10 months turned into three years at Bates as the men’s assistant coach and recruiting coordinator, and then I coached at George Washington University for six years. As the new men’s sweeps coach, what are your goals for the team? My short-term goal is to understand how the team and the club itself operate and to find areas where my experience can leave a positive impact. 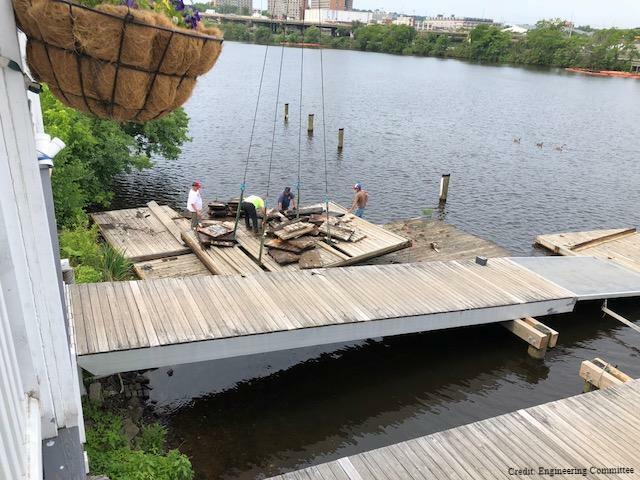 My long-term goal is to promote the team’s vision of providing a high quality, welcoming, and fun home for rowers who want to continue to train, develop boat skills and compete after college. If you could coach any rower, dead or alive, who would it be? When I lived in DC we weren’t allowed access to the boathouse one day because Michelle Obama took a sculling lesson. Coaching her would have been pretty cool. How did you end up at Riverside? 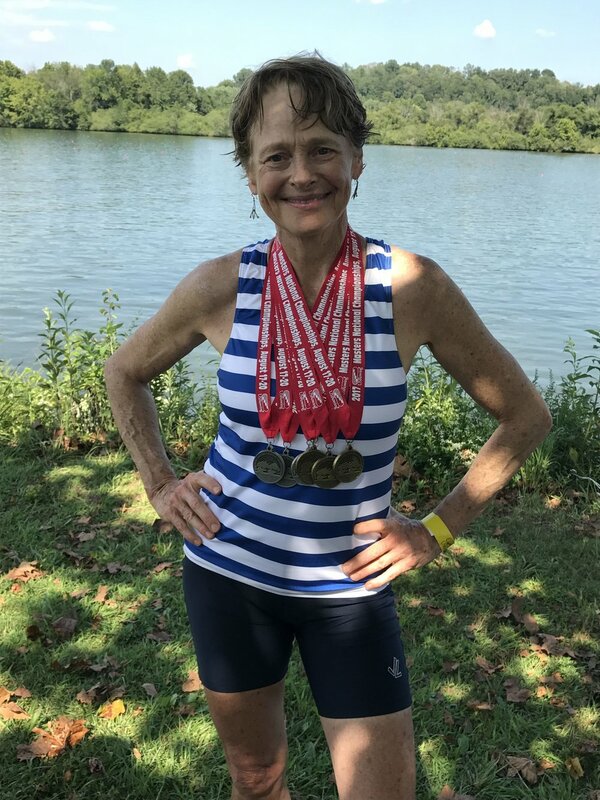 After nine years of coaching in college, I wanted to see a different side of competitive rowing. I’d heard from a colleague about the position being open and had a meeting with Mike Farry and Graeme Calloway. I was intrigued by the character of the team and the competitive goals that the captains laid out. How would you describe your rowing philosophy? My philosophy is simple: when people I’ve coached look back on their time with the sport, I want them to be able to say that the experience created a positive development in some aspect of their lives. 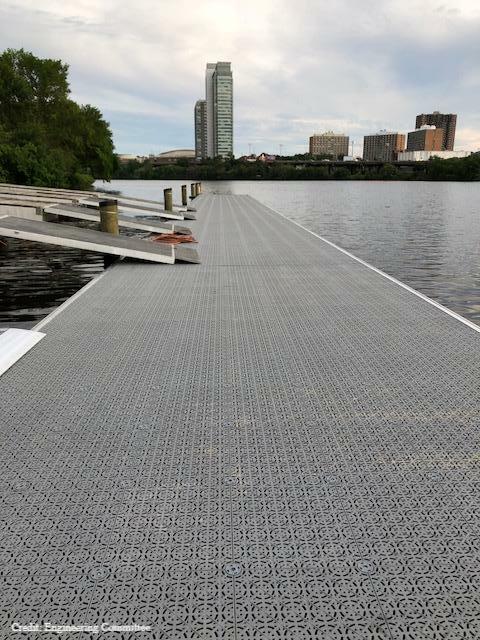 Canadian Henley might be in the books and many of us are taking a well deserved break before the start of the fall racing season but the summer heat is still here in Boston. And with the higher temperatures and UV indexes, comes a greater need to pay attention to our nutrition and hydration so that we can keep enjoying summer to its fullest. One thing that goes without saying is the importance of hydration. The main rule of thumb that I try to adhere to is drinking between 0.5 and 1 ounce of water per pound of body weight. So for example, a 160 pound person should drink between 80 and 160 ounces of water. This isn’t to say that all of this has to come from water alone. Fruits and vegetables have water in them, as well as quinoa and other grains have water in them so you don’t need to be trying to drink over a gallon of water per day. (you might be spending a considerable amount of time in the bathroom if you do!) One tip for getting hydrated: watermelon is a delicious summer fruit and is 93% water. You can eat watermelon to your heart’s content, get hydrated, and not have to worry about losing your beach body that you worked for on the erg over the winter. For those of us that still have races to compete in this summer, here are a few statistics to think about just in case you were on the fence about how important hydration is. Performance can be negatively impacted by as little as 2 to 3% body weight loss from sweat (e.g. 3-4 lb. for 150 lb. athlete) Additionally, dehydration can cause a decrease in the volume of blood being circulated in your body leading to your muscles not getting enough oxygen to perform to their true potential and exhaustion setting in earlier in a race. On top of that, your body is not able to flush lactic acid as effectively after a workout, leading to a longer recovery time between workouts. A general rule of thumb for how much water to drink before, during, and after a workout is 16 ounces or more 2-3 hours before a workout, 8 ounces 15 minutes before, drinking fluids as necessary during a workout, and consuming 16-24 ounces after a workout for every pound of fluid lost. If you’re someone who sweats a lot, or even if you’re not, its a good idea to weigh yourself before and after workouts to see how much you sweat out so you can adequately rehydrate. Additionally, you may want to consider adding a supplement to your water bottle for consumption during a training session. Nuun and GU make hydration tablets that are easy to carry and add a tablet to your water before you launch, plus they come in all different flavor options so you can find one that you like best. Take a look at the links below for more information on the benefits of staying hydrated and other tips as well. And if you have any questions or want a few more tips, you can come find me at the boathouse, chances are I’ll be there.